High Summer is almost here...less than two weeks to go! This will be our first year as a month long event. Last year, I decided to make all the seasonal 'thons a month long and everyone is loving it, including me. 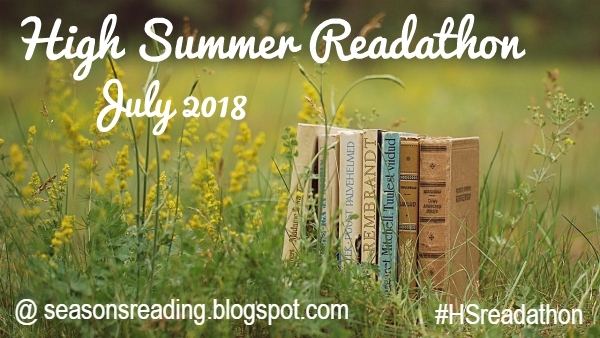 As I mentioned in the SciFi Summer wrap-up post, I will once again be hosting a special Christmas in July Readathon (in conjunction with the Christmas in July event at my Christmas blog) during the last four days of High Summer. So, July 28 - 31! Participation in that will be entirely voluntary and if you decide you would like to, you still don't have to do the whole four days. I'm completely flexible. 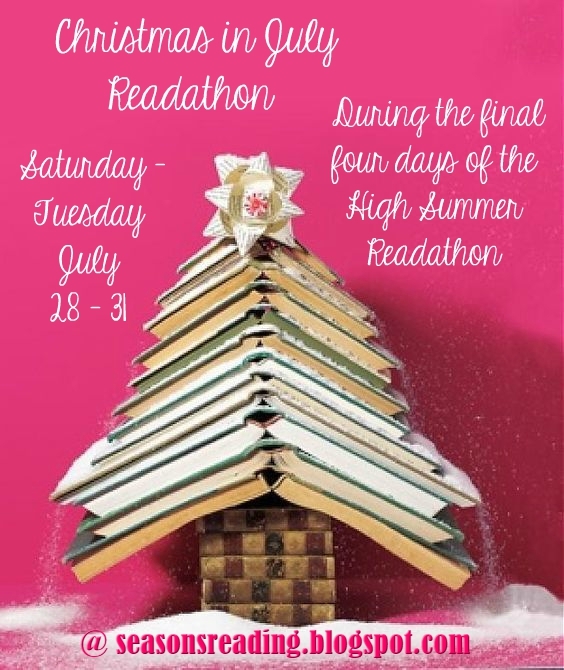 Also, you can even choose to read Christmas books during the entire High Summer Readathon, or mix and match. It's up to you. The official dates are July 1 through July 31, starting at 12:00 am Sunday the 1st, and ending at 11:59 pm on Tuesday, the 31st. That's central time (U.S.), but you can adjust your times according to your time zone (there's a time zone converter in the sidebar menu). Of course, like most readathons, the books read must be novels or novellas (adult or young adult are fine), manga, anthologies, non-fiction, and you can even read children's books (as long as you do read some novels too). Also, Christmas books this time too! You DO NOT have to participate the entire month. Join in when you can, start in the middle, end early...whatever works best for your schedule. As with all of my readathons, it will be an event of relaxed reading during which we can personally challenge ourselves and whittle away our ever looming TBRs. Guidelines for the readathon can be found HERE or you can access in the sidebar menu. Any information regarding rules for our readathons can be found there. Please do be sure to check the guidelines to make sure you're following along correctly. There are specific rules regarding signing up and wrapping up, especially in regards to the giveaway. Also, regarding the giveaway, I'll be again adding a Google form to capture names, email addresses and a link to your wrap-up posts so if you're interested in winning a prize (and you've met the sign up and wrap up criteria), I will ask you to fill in that form which will be located on the prize page. I will not be hosting any mini-challenges. However, if anyone else would like to host a mini-challenge or giveaway, you are more than welcome. I am also looking for prize donations so if anyone would like to contribute, let me know. Authors, this is a great way to promote your book! (Contact me via the contact tab in the menu). Our hashtag for social media is #HSreadathon ...and we have our wonderful Facebook group that is always very lively (there is also an access tab in the menu). Sign up in the linky below. You do not have to do a post now, unless you want to help spread the word (much appreciated). If you don't have a blog, use Facebook, Twitter, Goodreads, Instagram, YouTube. Having a blog is not required. Be sure to grab the button at the top of this post (there's also a grab code below the button in the sidebar. Note: the grab code is only for the High Summer button, not for the Christmas in July button). COYER is also doing a Christmas in July RAT from July 15th to the 21st, so I guess I'll be reading lots of Christmas books! I think I can finally do a readathon again! I messed up last time, Lets try this again. I'm excited, never participated in a month long readathon till now. Looking forward to the Read-a-thon. Thanks for hosting. I hope it is okay to use my Goodreads HSReadathon bookshelf. I will probably catch tag you on other media but, with the use of apps, now find I have a difficult time finding my URL. I’m sorry. I’m looking forward to the readathon. I love that it is a month and ends with Christmas! I will start out with a book from the Great American Book list as I’m doing a library thing with it. Great idea to use the Great American Booklist from PBS. Brilliantm Frances! Using my Twitter account this time. I'm glad to participate in this one. Looking forward to relaxing on my front porch and reading, reading, reading. Readathon will bring back the summer reading program I participated in at Houston Public Library when I was a young teen. Had my first bumper thumper in the Looscan branch parking lot trying to backup my mom's Chrysler. Work has been crazy. Wasn't sure what the plans were for July, but it looks like I am going to just make the time. Glad I saw your post this morning to remind me it is already July today! High Summer Readathon... here I come!